Chinese smartphone manufacturer, No.1 has recently stepped their game up when they released a smartphone of their own design. The X-Men X1, the phone that survived being run over by a car, has attracted a lot of attention because it was a rugged phone that ticked all the right specs. Not long after the release of the X1, the company announced a follow-up model, the X-Men X2. As can be expected, it is also a rugged phone with similar key specs to the X1, but upgraded in some aspects. The main difference between the two, is that the X2 will be sporting a Qualcomm SoC, the Snapdragon 410. The quad-core chipset is based on a 64-bit architecture and its CPU is clocked at 1.3GHz. It is packed with 1GB of RAM and 8GB of ROM storage. The X2 also surpasses the X1 in terms of network connectivity. The phone will get worldwide 3G support for 850/900/1900/2100 MHz, while the FDD-LTE networks covered are 800/1800/2100/2600 MHz. To find out 4G compatibility with your country and service provider, take a look here. The X2 will feature a 5.5-inch touch screen with 720p resolution display beneath. The screen will be protected with a layer of Corning Gorilla Glass. The primary rear camera is equipped with a 13.0MP sensor, while the front facing shooter has a 5.0MP max resolution capability. The phone seems to be damage-proofed in every way No.1 has thought of: it is granted an IP68 certification which, No.1 boasts, is one level higher than other ruggedized phones in the market. 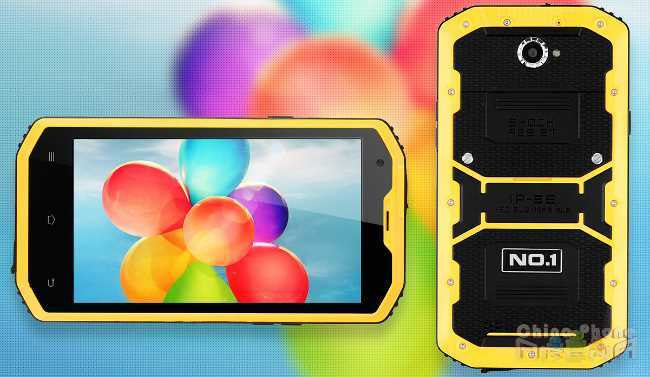 The X2 is waterproof, dustproof, pressure-proof, freeze-proof, shockproof, and can withstand high temperatures. Furthermore, the phone will be packing 4500mAH of power storage which is claimed to last 35 days of standby, making it very appropriate for outdoor adventures. The phone has been made 14.7mm thin, and weighs in at 226g. Android v4.4.4 will be running the show in the X-Men X2. The phone has been reported to be up for grabs around the $225 mark at the moment. The official specification list from No.1 is shown below.